It’s official: the smartphone has completely and forever changed our consumption habits as we know them. In just a few years, smartphones have managed to become our favorite device for reading the news, communicate with each other, socialize, surf the internet, buy, manage our exercise and much more. All of this makes smartphones a fantastic place to get yourself into your audience’s lives and pockets… but precisely because it is something so personal, it is very easy to mess it up. 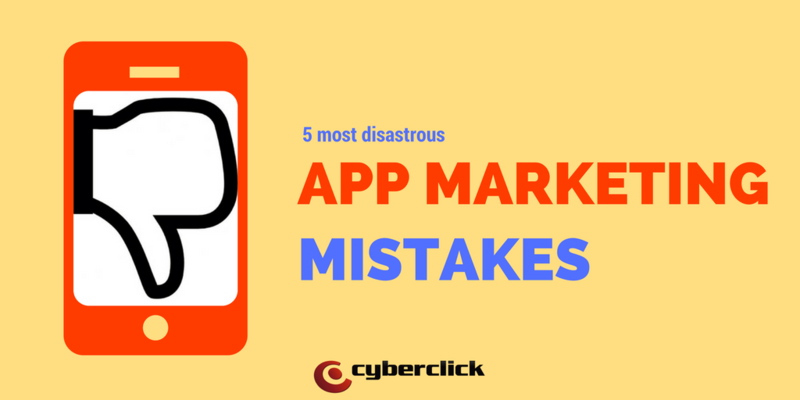 So this doesn’t happen to you, I would like to tell you today about the 5 most disastrous app marketing mistakes. Far too many brands attempt to compress their entire desktop experience onto a smartphone display… and, of course, it becomes a failed attempt. The result tends to be overwhelming, dysfunctional and unpleasant to look at. And to top it off, introducing data takes a lot more time on mobile devices, meaning that if you request the same amount of information as you would on desktop, it is highly likely that your users will get bored trying. Smartphones and computers are very different devices, and the opportunities they offer are equally different. A smartphone’s small display is not an obstacle, but rather something to help you focus on the essential. Moreover, it is important not to forget that smartphones offer a whole world of possibilities related to geolocalization. My recommendation: make your users’ lives easier by focusing on what really matters. Try keeping the potions to a minimum and then ask your users if they miss any of the features that were available on the desktop version. You will be surprised how well they get on without them. Yes, we have all seen Google Play’s and the App Store’s impressive download volumes… but that doesn’t mean that your app will succeed just by being in them. You need a good app marketing plan that makes the most of all the resources you already have to get people to download your mobile app. For starters, when users visit your website, it should be crystal clear to them that you have a mobile-optimized mobile app they can download. It’s not about turning your website into an ad for your app, but at least include a download button on each page. Secondly, you need to take care of your app’s SEO. App stores are the most common place to discover new apps, so make sure your app’s title, description and keywords are totally optimized. You can use an App Store Optimization (ASO) tool like SearchMan or Appnique. Another very important aspect are your reviews: the more positive opinions you have, the more downloads you’ll have. And, of course, you can (and should) also use the rest of the social channels for your app marketing strategy. Last but not least, do not forget that social ads can also be an amazing help when promoting your app. 3# Making a website for mobile devices and trying to pass it off as an app. Designing an app from scratch for multiple platforms is a very big challenge. However, With over 750,000 different applications available on the App Store and Google Play, users have become very demanding in terms of quality. Under these circumstances, launching an app that simply redirects users to your website is very far from a good market strategy. Not only does it ruin the user’s experience, it overlooks one of the big advantages of apps - that they can be used even when there is no available internet connection. The solution? Instead of making sure your app is available on all platforms from the very beginning, start of by focusing on just one. Like this, you will learn what features are most successful among your target audience. The biggest challenge in mobile marketing is the retention of users. Only 10% of an app’s users will still be using it 6 months later. And after all the effort you poured into designing your mobile app and marketing it, you can not let 9 of every 10 users get lost along the way. To make sure your promotion strategy is successful, you have to get to the core and understand the reasons why users keep using an app. Consumers will only come back if you can consistently offer them value. So, from the moment you sit down to begin designing your app, ask yourself this question: Why would someone use your app more than 5 times? Find a consistent and recurring use case. To do this, you will need to have an in-depth understanding of what your users want from your app. why they use it, how they use it, and when they use it. If you don’t know the answers, investigate! Create mechanisms for your app to reconnect with consumers and remind them of its presence. For example, you can launch exclusive content or promotions. It is also good to update your app frequently to remind your users not only that it exists, but that it just gets more and more useful over time. The power of the smartphone and the mobile device in generally lies in it proximity. When a user installs your app, they are literally placing you in their pocket, wherever they go, and this is an amazing opportunity to truly connect with them. When using your application, users are sure to have problems, questions and suggestions that will help you improve. For this reason, a good app marketing strategy is not complete without bidirectional communication channels. In today’s day and age, we have become used to expecting all but immediate customer service and your app should be no exception to this. So, be sure to include tools within the app itself for people to be able to ask you their questions and comment, and answer them as quickly as possible. If your users feel appreciated and like they are given attention, your will gain their priceless loyalty.